21 May Your Questions about Eyelash Extensions… Answered! Our NOVALASH Certified Lash Technician Jessica answered some FAQ about the newest service on our spa menu- eyelash extensions! Now scheduling appointments! Question: What are NOVALASH Eyelash Extensions? 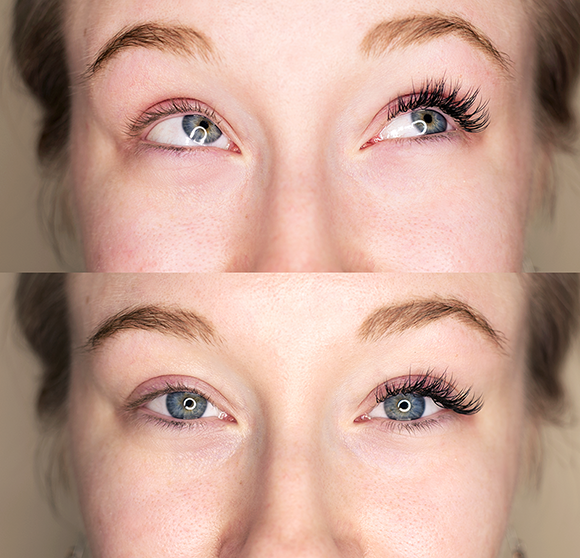 Answer: NOVALASH Lash Extensions are a way to extend the length and thickness of the natural eyelash. The extension is individually bonded to each separate lash at different lengths depending on the stage of lash growth. They are a practical, convenient and a beautiful alternative to the daily use of mascara or band/cluster false lashes. Q: Why choose NOVALASH for my extensions? A: We highly recommend NOVALASH eyelash extensions, as it is the only adhesive in the lash extension market that is both oil-proof and water-proof. Many times you hear that you cannot get your new set of extensions wet for 24/48 hours. While this is true with some companies, NOVALASH stands out as it’s the opposite. A: Touch-ups are recommended after the initial full set application to refill any new growth lashes that have naturally cycled out, based upon your hair growth. To maintain a full, thick appearance, we recommend a fill every 3-4 weeks. Q: Can I wear other eye makeup with extensions? A: Yes! The only things that are not recommended are water-proof mascaras, as well as any products that contain glycol and carbonates. A water-soluble mascara (such as the NOVALASH Mascara that comes in your AFTERcare Kit) can be used in combination with your extensions between fills to maintain a full look. Cleansing your extensions daily, is very important as well! Q: I have an upcoming special event. When should I get them? A: As with any cosmetic products, there is a small chance that an allergic reaction can occur. Because of this, we recommend coming in for a full set at least a month before to try them out! A fill can then be done 3-5 days before your special occasion. Q: What can I expect during an appointment? A: A full set will take up to 2.5 hours, while fills are up to 1 hour. Wearing makeup to your lash appointment will only take away from lashing, so please come with no makeup on the eyes. The guest will be laying with their eyes closed during this process – great time to get some beauty sleep! Q: How much is this service? A: A Full Set Application is $200- we care about the integrity of your health of your lashes, so we’ve included a complimentary AFTERcare Kit with your first full set. Fills are $55 (1-2 weeks), and $75 (3-4 weeks). We would love to hear from you! To schedule an appointment, Call Savoye Salon Spa at 920.434.4247.